As mentioned in a post earlier this year, 2018 is a year of change for De Bethune, both of management, and of focus. The markers of this change, horologically, were the Titan Hawk v2 covered in that post, and the launch of the DB28 Steel Wheels. The ‘Steel Wheel’ is named after the Rolling Stones comeback album of the same name. In essence, it is an open-worked iteration of the DB28 collection (including the size, 42.6mm), but with some very noticeable amendments. At the centre of the dial is the familiar titanium delta-shaped bridge is adorned with the ‘Côtes De Bethune’ decoration. However, this time its middle has been removed as a part of the open-working. The hands are new – the hour hand is translucent, to allow for the view of the movement, and is rimmed with blued steel. To make it easier to see (use), there is thankfully a blued section in its middle. The hour markers to which it points are the same steel balls that De Bethune have previously used. For those who are fans of the De Bethune blue, it is here in a myriad of forms, from the signature spherical moon phase at 6 o’clock which is made of blued steel and palladium to the blue titanium inner ring, as well as the hands. The titanium polished sphere hour markers that are also characteristic of their watches also make an appearance here. One notable attribute of the Steel Wheels is the new manual-wind De Bethune Calibre DB2115V4, which beats at 4Hz and has six days of power reserve thanks to a patented double self-regulating barrel. It has a titanium balance wheel with white gold inserts that was patented in 2016, as well as the similarly patented De Bethune balance-spring with a flat terminal curve, patented triple pare-chute shock-absorbing system, and silicon escape wheel. 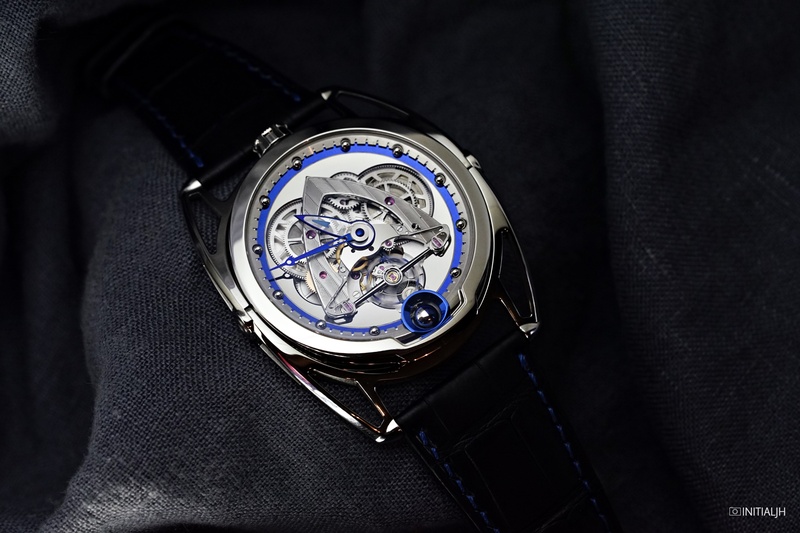 In a polished Grade 5 titanium case with their patented articulated lugs that make wearing a De Bethune easy and comfortable for all wrist sizes, the De Bethune Steel Wheels is limited to twenty-five pieces and has an RRP of 83,000 CHF. if money was no object, I would own in a heart beat, or less.